I absolutely love this quilt! It goes so well in my bedroom, the colors match well, and because it is not too light, I am not cold at night. 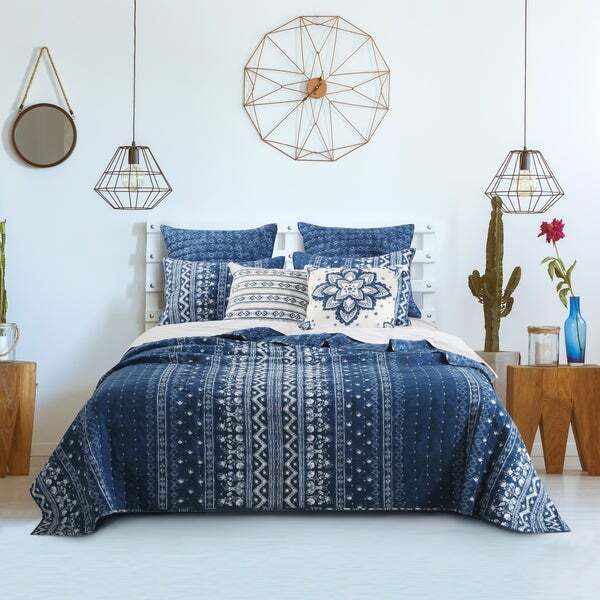 Relax in the deep indigo splendor of this bohemian bedding. Soft and comfortable with a painterly artisan vibe and romantic feel, this set reverses to a complimentary geometric print. Rustic channel quilting enhances the durability of each piece. Oversized for better coverage on today's deeper mattresses. Prewashed with extra softener for unparalleled comfort. Quilt set comes with quilt and two pillow shams (one sham per Twin set). Dimensions: Twin set includes one 68x88" quilt plus one 20x26" pillow sham, Full/Queen set includes one 90x90" quilt plus two 20x26" pillow shams, King set includes one 105x95" quilt plus two 20x36" pillow shams. Dimensions +/- 2". 100% Microfiber polyester face and back; 100% Polyester fill. Machine Wash.
Really my fault, but didn’t read carefully to see it’s polyester; I prefer cotton. This quilt set is attractive so will use for quests. This set has been a great compliment to solid navy curtains, rugs and accessories. It's reversible with two patterns to choose from. I've got the one shown above in use, as it's a bit more sophisticated in this room. The other side seems more kid-like, perhaps even a bit country-themed. Pleased with the casual comfort for now. The Embry Indigo Quilt Set was as nice as I hoped or expected it would be. The fabric is nice and easy to care for and the colors are as pictured. I love this quilt set - the indigo is beautifully retro. I only wish there were more cotton in it. This quilt was the right color but I'm used to the heaviness of a duvet so this quilt was too light-weight for me. It wasn't very long on the sides either so you could see the sides of the mattress. I have a king size bed and the king quilt was too short on the sides. Sad to have to return it as I liked the bohemian pattern. I gave this quilt set 3 stars because while it is very pretty, it is very thin and doesn't feel like it is very well made. I didn't open it until right before my company came, so I can't return it since it's been used. I probably would have because I think a set like this should be at least half the price I paid. I love this quilt. The color is beautiful. It’s not too think, but also not too thin. I found this blanket on overstock after looking all over for something casual and light, but still with a grown-up feel. Let me say, it wasn't an easy task! I ended up turning it sideways and keep it at the end of our bed. The stripes look better that direction, since my bed has vertical bars. Because of that, it's not quite as wide as I'd prefer, but it wasn't made to go that direction, so that won't affect my review. I like this one real well. The blue /navy is bold. It's soft, light weight , good amount of insulation. There are long strings all over it. 4 stars &gt; Didn't feel like it was totally finished. Cheap ... and it looks it. Not happy with the quality of this item. It looks "polyester". Does not lay nicely on the bed. I gave it to GoodWill. I love the color and its soft. The quality of the product is very good. I love it! Thank you so much. Very beautiful to look at, does not wear well with dogs in bed, snags and is not made well. Bunting shifts. I will use sham with other covers for a mixed up look in my blue and white bedroom. Really pretty on my bed. I love it and would recommend it! My daughter wanted a change from pink to denim blue. This comforter was exactly what she wanted. Paired with grey sheets gave her whole room a new look. "I have the same question as Sarah did on Feb. 5, 2018. Is there an answer?? " At this time we do not carry the accent pillow. We apologize for any inconvenience we might have caused. "I love the quilt but would also like to have the small accent pillows shown in this photo with the quilt. Does anyone know where I can find them? The brand name or just if they are on this site, I have looked through the majority of pillows on your site and have not been able to find them."